It’s odd how Christmas changes after you have children of your own. When you’re young it’s about your family and its traditions, those traditions predicated by your parents and continued in the face of waning enthusiasm by you and your siblings — you know, when the magic wears off. Then you’re a teenager and a young adult and you’re trying to figure your own life out, much less the life of a fictitious character from the North Pole who may or may not be living on the tip of an iceberg. During that time you wear the costumes ironically and give things like cameras to your friends just because. Then you grow up all the way, and you get married, or at least have a significant other. Valentine’s Day takes on more significance, but Christmas begins making a comeback too. You buy and make sentimental gifts for each other and that makes it all less ironic somehow. By the time kids come along you’ve gotten into a pattern that for all intents and purposes works for you. You buy each other $100 worth of presents each year and wonder why your credit cards always seem to be maxed out come January, but you’re happy. Then the first kid comes and you realize you’ve been doing it wrong for years. Christmas is, after all, a holiday for children first and foremost, and you come full circle when you have some of your own. That’s when you begin to create your own family traditions that will at some point become the ones your kids will eventually mock ironically as young adults. Or maybe they’ll appreciate them so much that they pass them on to their own children. It’s what we hope, of course, that having those children of your own will bring back the magic for you, that magic that has taken years to disappear and that only seems to emerge somewhere near Disney World. But it’s not a mouse that brings back the real magic. It’s instead a burly man from up north who may or may not be a distant cousin to Jesus Christ. Time to leave out those cookies and that milk. That’s how it was in 2006 after our first child was born. For the previous five years we had gotten into a routine — the staying home all day, the watching movies/TV shows marathon, the exchange of presents in the morning, the sappy cards, and the festive feel — but suddenly it was no longer about us. Our presents that year were mostly geared toward Alexa, and there was the whole decision about Santa Claus. For most families I guess it’s not really an issue, but I wasn’t raised with Santa Claus and my wife was. I was adamant that I didn’t want our child believing in Santa Claus, and Heidi was just as adamant that she wanted that type of magic in our Christmas celebrations. So we made a deal, a deal that both of us could live with. We traded Santa Claus for baptism. We don’t go to church, nor do we believe that any religion is the “true” religion. But Heidi wanted us to have Alexa baptized as a baby, and I never quite got why. For me, I was baptized at 10 years of age because I made the choice, and I wanted her to have the choice instead of automatically being baptized as a child. So Heidi said no baptism as long as we could have Santa Claus, and during that first Christmas as parents I definitely saw why. Alexa’s little face lit up when she saw all the gaudily wrapped presents from Mr. Claus, even though she played with the cardboard boxes the gifts came in more than with the gifts themselves. There was a sparkle in her eyes that was magic in and of itself and that transformed that first Christmas into THE first Christmas. It was like we were in that stable beaming down at the baby Jesus and celebrating that most momentous birth. 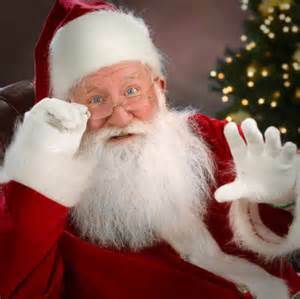 Funny how Santa Claus can do even that for non-believers, and through the eyes of children. It was the best trade I ever made, and I don’t regret it for a second. Now our traditions live on, even as both of our children grow older by the second, but that magic is fleeting and I’m glad we appreciate it while it’s here.